Internet-label NoiseUp is glad to present its last release of the year 2018. 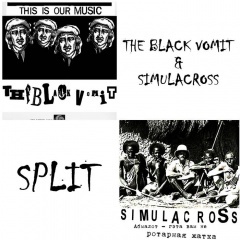 Russian avant-garde project The Black Vomit and Belarusian noise formation Simulacross present the Split. The Black Vomit is some kind of the union of painters, musicians and poets of St. Petersburg. Musically it is experimental avant-garde free-jazz with percussion elements, where all the ideas of all the members are implemented. This union has several performances on small home stages of experimental scene in their home city. Simulacross is a Belarusian noise project, which is combining different levels of noise music, percussion industrial and musique concrete. Together these experimental projects created two comparable, but uncontrollable and unpredictable action in three acts. Two untitled jazz compositions are opening the split and noise attack will complete the picture. Play of life. Play of death. Play of experiments. Split will be out for free download on the official website of NoiseUp and on the Bandcamp page of the label. Noise the world! Internet-label NoiseUp presents the collaboration of two experimental projects. 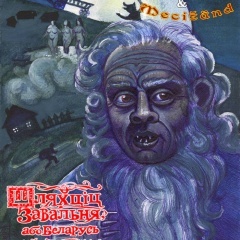 Russian group of musician Mecizand was formed in the beginning of 10s and counts more than 10 album in its discography. Last two were released on NoiseUp. Their music varies between ritual and dark ambient, musique concrete and free jazz. Belarusian project Simulacross appeared on the experimental music map in 2002 and during the years of existence created different sound collages in percussion and improve industrial, noise and musique concrete. This album will be the debut collaboration of Simulacross and Mecizand. 10 new compositions are presented on the album made separately by every project and collaboration created by both. Part of the tracks is made with guest musician, among which you can find Belarusian folk-singer Irina Hlushets from the band Yagorava Gara, voice of Vladislav Novozhilov from Belarusian metal-band Gods Tower and bass of Pjotr Shkalenok from the retro-beat project Yatata. Also different musician playing of various musical instruments such as harp, flute, violin, organ, calimba, trombone and many others could be heard on the album. It tuned to be an explosive mixture of post-folk electroacoustic avant-garde with ritual atmosphere and percussion soundscapes. Fascinating experiments of Russian-Belarusian collaboration will be available for free download on January 29th on the official NoiseUp website and on the Bandcamp page of the label. The digital release will be followed by the physical cassette limited edition on the label Hvedrungrsmil Records. It will be out in the beginning of February. Noise the world!